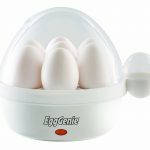 Rollie Eggmaster Review: The Rollie Eggmaster also called the Rollie Egg cooker is a unique gadget capable of cooking eggs vertically. Yep vertically. This unit is capable of cooking eggs into a tube shape and with its non-stick coating ensures virtually no cleanup is needed. The Rollie Eggmaster is a fairly compact gadget measuring in at only 3.5 x 3.5 x 9.25 inches. It’s compact size and lightweight make it easy to move around for storage and you can take it with you while traveling. You will notice with this unit that there is no on/off switch. So as soon as you plug it in the unit is powered on. What you do get is two useful indicator lights towards the base of the unit that will let you know when its on and ready to be used. The light turns red when the unit is connected to power and green light turns on when its hot enough to use. 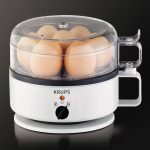 The unit comes with a non stick cooking chamber that allows a cooked egg to easily pop out from the chamber. When you un-box the unit you will also find a cleaning brush that you can use to clean the non stick coating. The unit does not come with a lid, you will find that as the egg cooks it will pop out of the hole at the top of the Eggmaster. 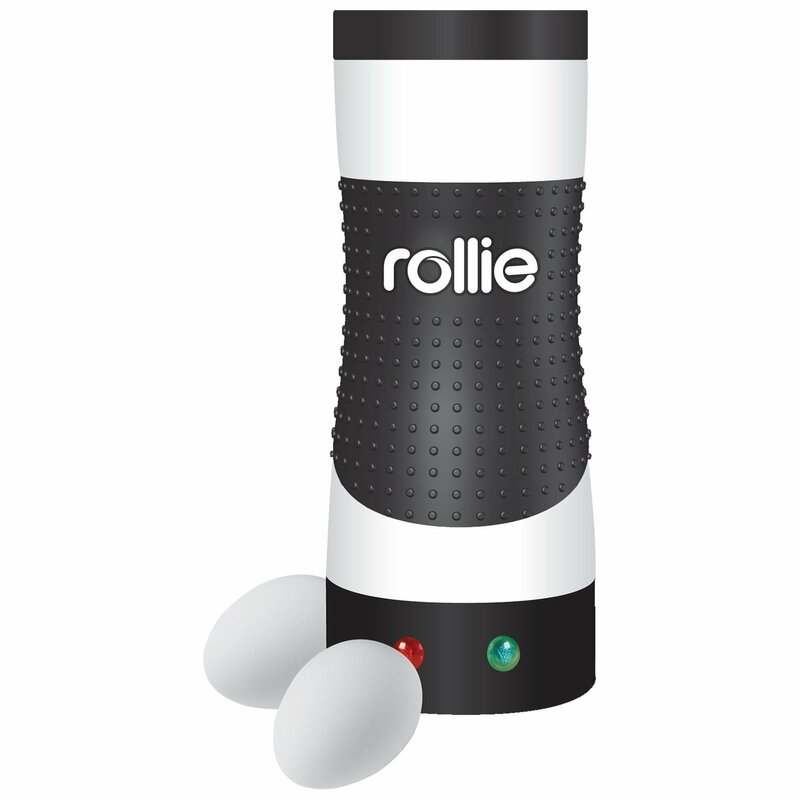 Rollie Eggmaster – What’s it like to use? The main selling point of this unit is that it will quickly cook your egg dish and pop it out into a roll. But you don’t have to stop at cooking just eggs since the Rollie Egg Cooker is a vertical cooking chamber you could try using the supplied recipe book to find more interesting recipes or make your own up. You could try using the unit to cook pancakes and deserts. 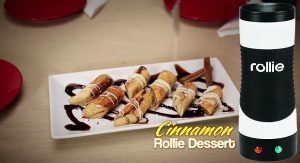 When you first use the Rollie it will seem odd, but once you have mastered using it you will enjoy the fast cooking and easy cleanup. For the best results and to ensure the egg comes out cleanly you can use a non stick spray. Make sure your generous with the spray to ensure the eggs don’t stick inside the chamber. As mentioned earlier when you plug the unit into the mains power it will be on. You will know its ready to use when the green light on the front of the unit comes on. 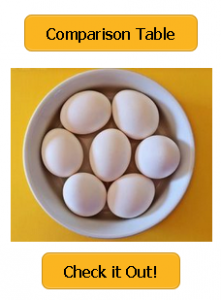 It takes between 6-7 minutes to cook the egg yolk to hard boiled doneness. If you do decide to leave the unit on for longer intentionally or unintentionally then your egg will pop out with a nice crust. To ensure you get a great cooked dish spray the non stick spray and let the unit preheat before dropping in a egg. You can use bamboo skewers but the unit will work fine without them. If you have no skewers then wait for the egg to pop out at the top of the Eggmaster then gently turn the unit on its side and you should be able to shake out the egg onto a plate. Wait for a minute or two for the egg to cool down before eating. One you have finished cooking make sure you unplug the unit. Cleaning is easy with the supplied brush. You do have to keep an eye on the Rollie since there is no way of setting the unit to cook an egg to either soft, medium, or hard doneness. To get a hard setting as mentioned it will take between 6-7 minutes. So it may take some experimenting to get the egg you want. You do get a recipe book with the unit that gives clear instructions on how to get the most of the cooker. Make sure you use plenty of non stick spray. 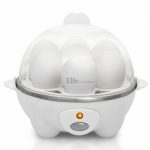 Should I buy the Rollie EggMaster Egg Cooker? 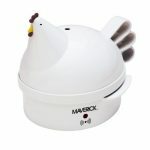 With the Rollie Egg Cooker there is no need stand above a stove. It’s super easy to clean and compact so does not take up much space on a counter top or up in a cupboard. This gadget does look innovative and different so will definitely be a talking point in the kitchen. The great thing is that it’s not just a novelty appliance it does actually work. So if your after something different that works this could be the gadget for you. For some people the Rollie Eggmaster is a fad but for others it is a cool and innovative gadget. If your after something different, enjoy eating scrambled eggs and hate cleaning up then the Rollie Egg Cooker could be for you. 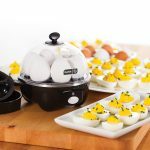 If you after a more traditional cooker capable of feeding an entire family on a single cooking cycle then you might be interested in the popular Dash Go Rapid Egg Cooker that is capable of preparing up to 6 boiled eggs in one go. To find out more read our Dash Go Rapid Egg Cooker Review.